Comparing the proportion of trips done by different modes of transport is fraught with difficulty. Different countries measure it in different ways, and it’s hard to get datasets that match. Some datasets are for all journey purposes, some just for work journeys. Some are based on where people live, some on where they work or go to school. 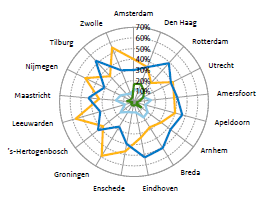 However, the Dutch National Travel Survey on page 108 has a chart for internal work journeys in seventeen Dutch cities which can reasonably be compared with English census data. 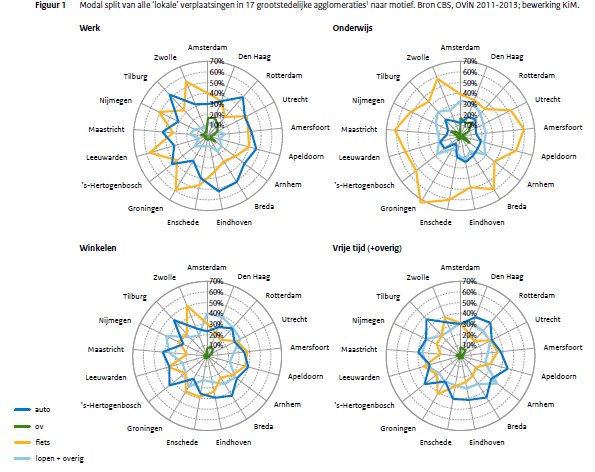 The four graphs cover work (werk), education (onderwijs), shopping (winkelen) and leisure/other (vrije tijd + overig). There are lines for car (auto), public transport (ov), bicycle (fiets) and foot/other (lopen + overig). A few points to highlight: cycling is huge for education trips, walking is quite low for work trips, and public transport is only significant inside the major cities (and not that significant, even there). Remember that this is for trips inside the cities. A large proportion of trips are inside cities, but not all, by any means. I have produced similar figures for work trips from the English census – this uses the MSOA dataset, to restrict it to journeys that start and end in the same city, and excludes home working. London is defined as the whole Greater London area; for other cities I have used the district-level authority (which doesn’t always cover the full built-up area). 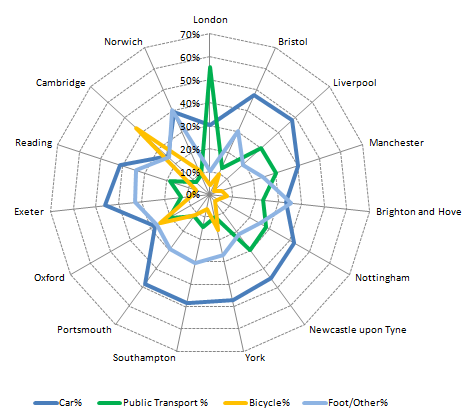 The graph shows the 15 cities with the lowest level of car use, in order of the number of internal commuters. The Dutch graph is shown beneath, for comparison. It is clear that public transport is much more significant for internal city journeys in England. The difference is that England has much more bus use. London is exceptional, but a typical value for large cities is around 30%, and smaller cities can be as high as 20%. Car usage is similar (though remember that these are the best in England in that regard). Walking is much more significant in England, cycling (with a couple of exceptions) much less so. 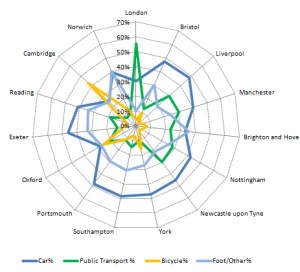 In terms of strategy, the normal policy in England is to reduce car use, and promote the alternatives. Dutch driving levels appear to be similar, and English policy is to promote public transport (and walking) rather than scale it back. So rather than directly copying the Dutch, it looks like we’re going to have to find a slightly different approach, which continues to give a large role to buses and walking, alongside trying to provide more widely for cycling. 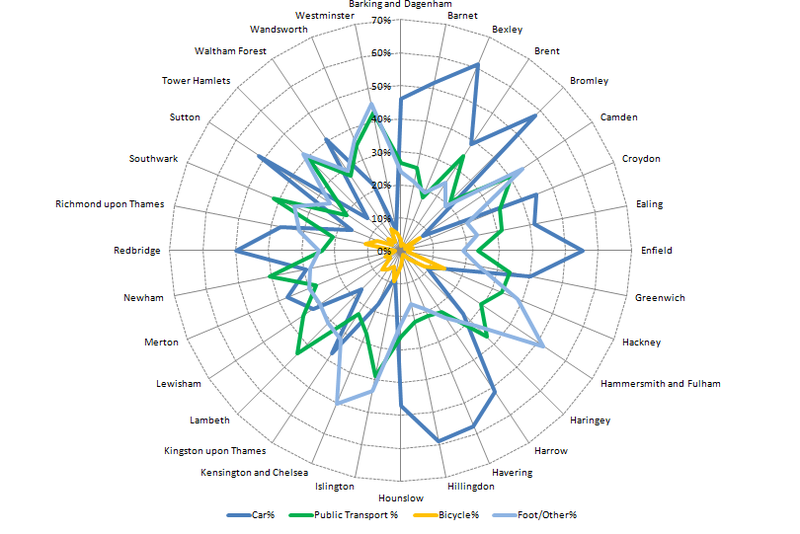 I’ve also calculated the same figures for the London boroughs individually, restricting it to journeys within the borough. Given the prevalence of work in central London, this needs to be used with care, but it does perhaps give an indication of the situation for short (non-work) journeys within each borough. Transport Paradise is a vision of how UK cities can be adapted to make them wonderful places to live and work. This vision is based on what's been done in Oxford, and shows what is politically practical and affordable, given a typical UK urban-form and road-form. Oxford is famous as a university city, and for making cars. Oxford gave up building new roads in the 70s, and has found better ways to get the city moving. Other cities can start towards becoming transport paradises, if they calm traffic, and make it easy to get around by bus, by bike, and on foot. Why can’t a bus … be more like a tram? Buses & Bikes – Rivals or Colleagues?